아래층 기단의 4면에는 가운데에 기둥 모양의 조각을 하나씩 새기고, 조각에 의해 나누어진 8곳에 비천상(飛天像)을 도드라지게 조각하였다. 위층 기단에도 각 4면의 가운데에 기둥 모양을 새긴 후, 기둥을 중심으로 왼쪽에는 4천왕상(四天王像)을, 오른쪽에는 천부상(天部像)을 배치하였다. 사천왕과 천부상은 모두 부처의 법을 보호하고 지키는 신으로 이들을 이렇게 복합적으로 표현한 것은 보기 드문 모습인데, 이는 통일신라 후기에 가져온 변화인 듯 하다. 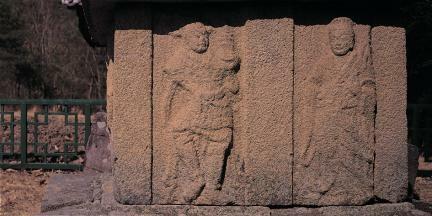 The center of each of the four faces of the lower layer of the stylobate is carved with a pillar pattern dividing the surface into two equal parts containing images of flying fairies engraved in relief. The centers of the four faces of the upper layer are also carved with pillar patterns, while their left-hand surfaces are engraved with images of the Four Guardian Kings, and their right surfaces, with images of ‘heavenly beings’. It is very rare in that it is carved in a delicate and detailed manner with images of the Four Guardian Kings and heavenly beings, which are deities that protect Buddha’s law and doctrines, and incorporates changes that emerged during the late Unified Silla Period. 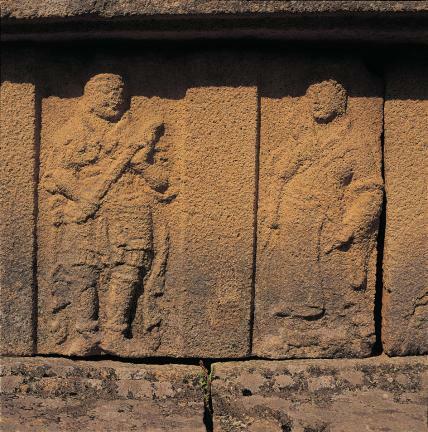 The main body consists of core and roof stones each separately hewn from a single stone. 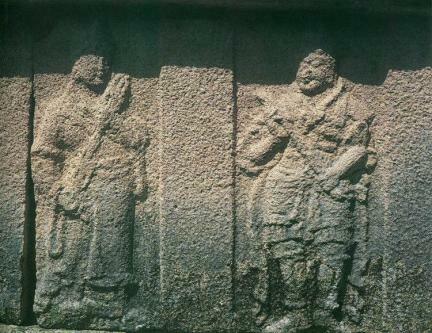 The four faces of the core stone of the first story are engraved with images of Bodhisattva. The first and second stories’ roof stones have four-tiered cornices, while the third story’s roof stone has a third-tiered cornice. The eaves are horizontal and turn swiftly upwards at the four corners. The top ornament of the finial is missing, and the square supporting stone is placed upside down, apparently having been misplaced later. 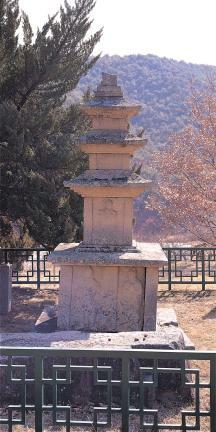 Originally, two pairs of stone lions were placed on the upper layer of the stylobate; however, only two lions remain and they are kept in Gyeongju National Museum (Treasure No. 202; Stone Lions from Gwandeok-dong, Uiseong). 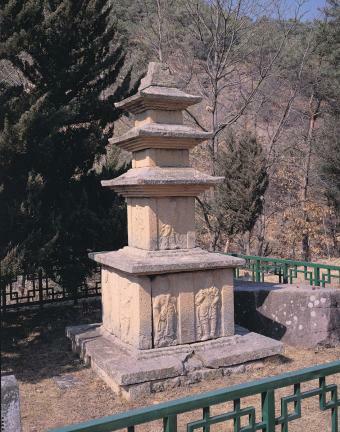 Along with the Stone Brick Pagoda of Bunhwangsa Temple, Gyeongju (National Treasure No. 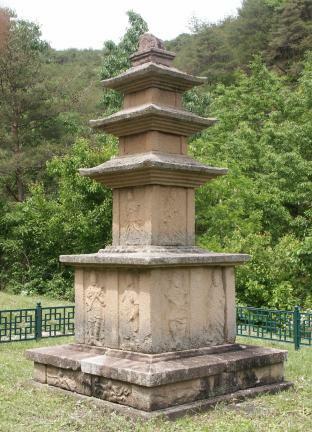 30), this pagoda is the earliest known example of a pagoda with a sculpted animal design. This style is thought to have survived into the late Unified Silla Period. It is assumed that the pagoda was erected during the 9th century when pagodas were built with decorative carvings. Although this pagoda is not particularly large, it is a splendid work notable for its beautiful sculptures.